Tim Muldoon, associate professor of biomedical engineering, has earned the National Science Foundation's Faculty Early Career Development Program award, one of the most prestigious awards given by the organization. Editor's note: This feature is the first in a series highlighting the College of Engineering's 2018 Faculty Early Career Development Program winners. FAYETTEVILLE, Ark. 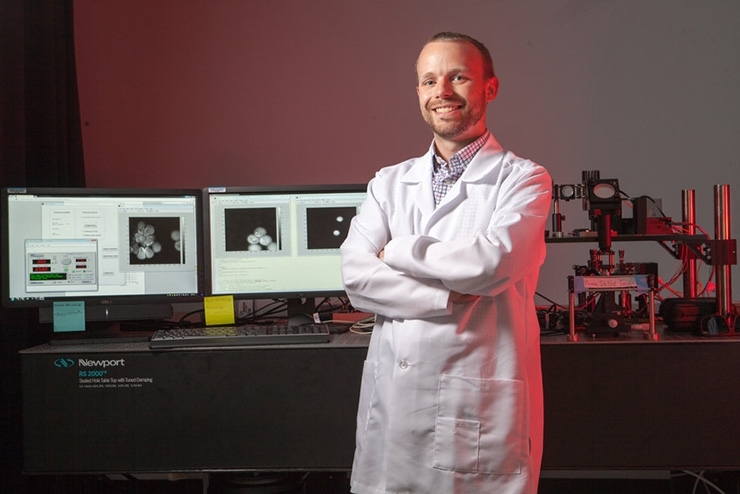 – For the Department of Biomedical Engineering's Tim Muldoon, a prestigious $500,000 National Science Foundation grant began with a childhood telescope in his backyard. Muldoon was selected in March for the highly competitive National Science Foundation Faculty Early Career Development Program award. It's the most prestigious NSF award given to junior faculty members who show outstanding promise in both teaching and research. Muldoon's project focuses on a probe that can create high-quality images of living tissues in the human gastrointestinal tract. It could be a major development in preventing and treating colon cancer, which is the third most common cancer in the United States, according to the Centers for Disease Control and Prevention. For Muldoon, his journey to this moment in his career began in suburban Detroit with a hobbyist's telescope. "I was fascinated by how the scope worked, how light works, how you can reveal something that's invisible." "I had a little telescope and I'd look at the moon, planets," Muldoon said, sitting in his office in the Engineering Research Center. "I was fascinated by how the scope worked, how light works, how you can reveal something that's invisible. Something that's just a dot in the sky - you've got this magical instrument and suddenly you can see a whole planet." In the late 1990s, Muldoon was in high school and the Hubble Space Telescope had captured the world's attention for its never-before-seen images of the universe. "That was when I got into the more science-y side of things," he said. "How do you use this instrument to look at a star, learn about the elements present there and figure out what that means?" That linking of the magic of a telescope to the quantifiable aspects of research led Muldoon to spectroscopy, a broad field dedicated to exploring how light interacts with matter. As an undergraduate biomedical engineering major at Johns Hopkins University, Muldoon became interested in the field of biotechnology, a burgeoning industry in the late 1990s. He ultimately was drawn into the engineering aspect of the field, so he put aside his interest in imaging and optics. Like many biomedical engineering students, Muldoon went to medical school. His time at the Houston campus of Baylor University Medical School nudged him toward the world of teaching. "So, you learn how to explain things at different levels, to people from all walks of life. I think that was my first indication that I might be interested in teaching." "I grew a lot there," Muldoon said. "They say med school is like drinking from a firehose, and it is, but there are also all these awkward situations. When you knock on a patient's door, you don't really know what's going to be behind it, what you're walking into. It could be someone unable to communicate, or someone unwilling to speak with a lowly medical student. I had all of that happen. So, you learn how to explain things at different levels, to people from all walks of life. I think that was my first indication that I might be interested in teaching." But, Muldoon found that for his personality, medical school could be very formulaic. "I started to miss more of the tinkering, building, experimenting side," he said. So instead of continuing directly on a Doctor of Medicine-only trajectory, Muldoon applied to and was accepted to the Medical Scientist Training Program, and began work in a Doctor of Philosophy program in bioengineering at Rice University. "That's where I really started merging my two interests — the microscopy and endoscopy with the biology and medical side," Muldoon said. His research at Rice focused on using an optical fiber to get high-resolution images from an endoscopy, a common medical procedure that involves inserting a tube down the throat with a light and camera attached. "That was really the first time everything clicked together — my nerdy interests with work that had future public health implications," Muldoon said. He received his Ph.D. in 2009, and completed his M.D. in 2010 from Baylor College of Medicine. Nearing the completion of medical school, Muldoon had a choice — take the clinical route, which meant years more training in clinical residency and fellowship programs, or jump into a competitive academic environment in search of a faculty position. He decided on the latter, and served as a postdoctoral researcher at Columbia University in New York until 2012, the same year the University of Arkansas launched its biomedical engineering department. He interviewed at the University of Arkansas and was hired as one of the first new faculty members of the Department of Biomedical Engineering. Raj Rao, head of the biomedical engineering department at the University of Arkansas, said, "I like to think of Muldoon as a 'triple threat' based on his background and training as a scientist, an engineer and a clinician. The perspectives gained through his diverse training have served him extremely well, especially in the biomedical engineering field. It is not at all surprising that the NSF has awarded him the CAREER award based on his commitment to integrating research and teaching in novel ways. Students in the program are indeed fortunate to have a faculty member like Muldoon who brings in these diverse perspectives, and I am personally extremely proud of his many efforts to contribute to interdisciplinary research and student success at all levels." 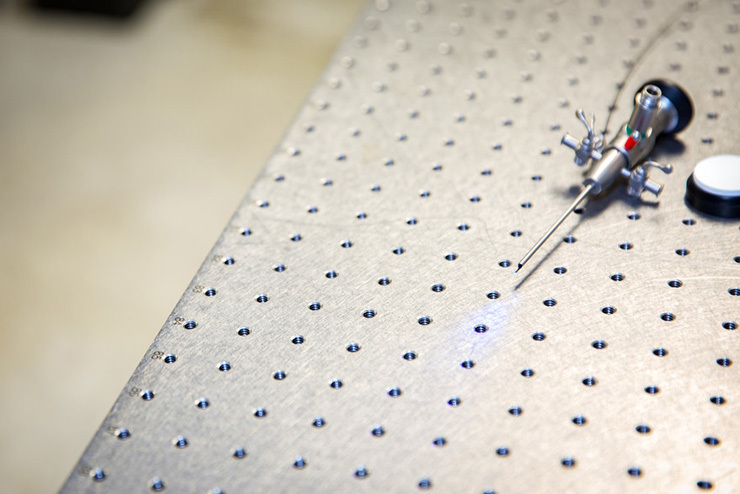 At just 2 millimeters in diameter, Muldoon’s scope hopes to provide high-quality images of living tissues within the gastrointestinal tract. Now, Muldoon is focused on his latest research, that fusion of his love for the wonders of imaging, spectroscopy and life-changing medical advances. Muldoon's research focuses on improving the way doctors view the inside of the gastrointestinal tract during an endoscopy. The research could have big implications for patients with colon cancer. With current technology, clinicians have only limited methods to gauge how the body is responding to treatment. Muldoon's project, which involves a 2-millimeter diameter fiber-optic scope, is intended to provide high-quality images of living tissue within the gastrointestinal tract and elsewhere in the body, so doctors can more effectively understand how cancer patients are responding to treatment. It also has broader implications for people with Crohn's disease or ulcerative colitis, which are known collectively as inflammatory bowel disease, or IBD, Muldoon said. "Right now, there's not a good way to predict when an inflammatory event is going to happen, and if you know anybody who's had one of these events, you know that's a big deal to them," Muldoon said. Patients with those diseases are often limited professionally and socially because of the unpredictable nature of symptom onset, which can include abdominal pain, extreme fatigue and urgent bowel movements, according to the Mayo Clinic. "There's also not a good way to find out whether patients are responding to biological therapies, aside from what their symptoms are doing," Muldoon said. "If we could catch patients who are going to have a flare-up, maybe we could treat it before it gets really bad." Muldoon said his work may also have long-term implications for "mesenteric ischemic" events, which are like a stroke of the blood vessels that supply the intestines. While not as common as cancer or other kinds of strokes, the mortality rate is considerably higher. "That's something I hope to explore in the long term," Muldoon said. The Faculty Early Career Development Program award provides $500,000 over five years, which Muldoon plans to use to fund graduate students to help in his lab, purchase supplies to conduct his experiments and support future generations of scientists through College of Engineering summer camps. For now, much of Muldoon's work will focus on lab tests of his scope, followed by an extensive review and analysis of the data collected. Learn more about the details of Muldoon's research. For Tim Muldoon, a passion for his research extends to teaching – his NSF award includes outreach programs to high schoolers interested in light, optics and imaging. Muldoon said his selection for the CAREER award was a pleasant surprise. "A lot of these proposals never get funded," he said. "This is super exciting — I thought about this for a long time. I wasn't sure if it was a viable project because it's more-high risk than some other proposals, but that's the goal of this — to push the limits of what's doable." Taking those risks are at the heart of innovation, Muldoon said, and research funded through the program can create a considerable return on investment. "I hope people recognize the importance of the government support that goes into this type of program. ... Research lays the foundation for future growth in a lot of areas, whether it's economically through new businesses, or bettering public health. "I hope people recognize the importance of the government support that goes into this type of program," he said. "The money doesn't go directly to the faculty member, it goes into investing in students and driving new research directions. That research lays the foundation for future growth in a lot of areas, whether it's economically through new businesses, or bettering public health." 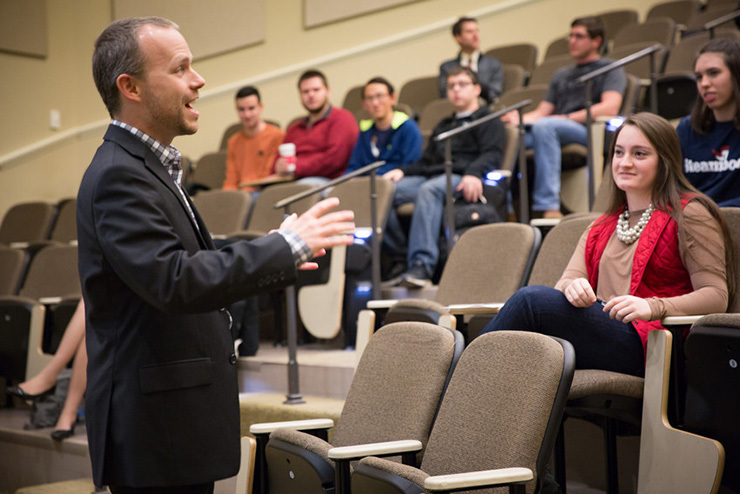 A part of Muldoon's grant from the NSF is focused on expanding the teaching aspect of his role. Muldoon, who is a first-generation college student, plans to work with the College of Engineering's summer camp program for students across the state of Arkansas. He'll be teaching high school students about light, optics and imaging, something he sees as an opportunity to help students chart a course for their futures. "These kids are at that formative age where they're trying to figure out what they want to do," Muldoon said. "I didn't really have an opportunity like this when I was that age, so I took this kind of circuitous route to get here." From southeast Michigan to Texas to New York, and now to Arkansas, a few things haven't changed. Muldoon is still fascinated by technology that lets humans take something invisible and make it accessible, and he still wants to find answers where the human eye can't see. He even breaks out his telescope from time to time, just like he did as a kid in suburban Detroit two decades ago.